Greenbuild Europe 2018 welcomed nearly 400 green building professionals to learn and celebrate the work being done in the across Europe. At Greenbuild Europe 2018, we welcomed nearly 400 green building professionals, leaders and stakeholders from 35 countries and 233 companies to learn, network and celebrate the work being done in the green building movement across Europe. Attendees logged over 773 CE hours for credentials like the LEED AP. Education sessions represented the full spectrum of green building in Europe, with sessions highlighting LEED, WELL, BREEAM, DGNB, GRESB, Passive Haus and more. For decades, the European building community has been among the greenest, continually raising the bar on sustainability. With 39.07 million gross square meters of LEED-certified space and two nations in the Top 10 Countries for LEED 2017, there is a great deal to celebrate. And this is just a small sample of what is happening in the region. 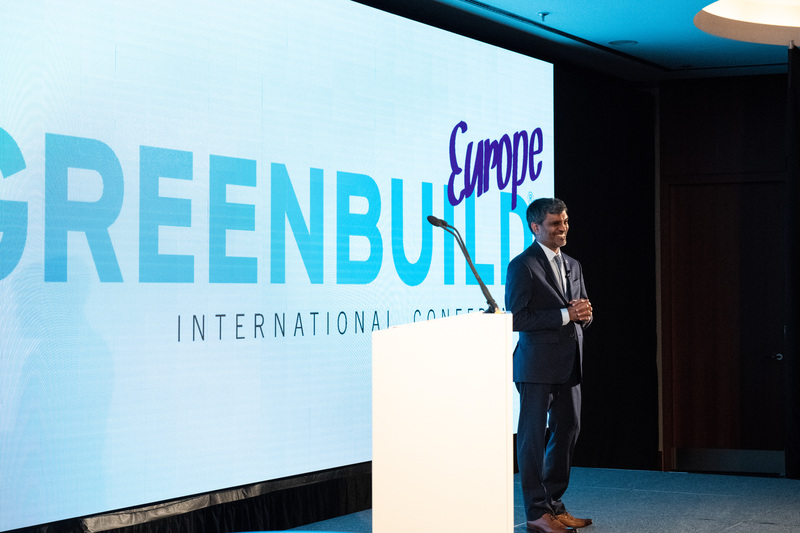 In his keynote address, Mahesh Ramanujam, President and CEO of USGBC and GBCI, highlighted how Europe has made some of the most impactful contributions to the green building movement. These are the everyday miracles, or "little wonders," that together create awe-inspiring change. Mahesh Ramanujam at Greenbuild Europe. On Monday, preconference workshops featured topics such as LEED Operations and Maintenance, LEED Green Associate exam preparation, GRESB real estate assessment training and green building materials. The Opening Plenary featured remarks from Mahesh Ramanujam, President and CEO, USGBC and GBCI; Lena Hök, Senior Vice President, Green + Community Advancement, Skanska AB; and Kay Killmann, Managing Director, GBCI Europe. The keynote addresses were delivered by two well-known figures in green building and sustainability: Rick Fedrizzi, Chairman and CEO, International WELL Building Institute, developers of the WELL Building Standard, and Selina Juul, Founder and Chairman of the Board, Stop Wasting Food Movement, Denmark’s largest nonprofit movement against food waste. 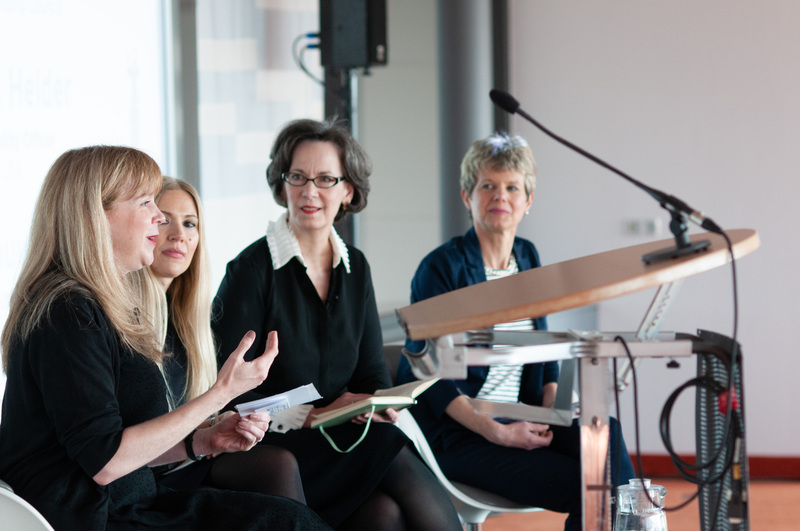 Women in Green speakers at Greenbuild Europe. O’Connor Sutton Cronin (M&E) Ltd.
Saint-Gobain, which designs, manufactures and distributes materials and solutions—key ingredients in well-being and the future of all. The event culminated in a keynote address by Ramanujam, who reminded us all of what is possible when we come together. Using the renowned image of the blue marble, a photo of Earth taken from the moon in 1972 and then recreated from a mosaic of individual images as inspiration, he reiterated how in the face of change, calamity and uncertainty, we still have the ability and responsibility through the work we do to contribute to great change. If you missed Greenbuild Europe, you still have four more opportunities to attend Greenbuild in 2018. Join us at one of the remaining events in Mexico, China, India or Chicago.